Referred to as The Guardian of the Abyss, The Scarlet Woman, Mother of Abominations, her place in St. John’s Book of Apocalypse (Revelation) and Enochian magic inspired occultists to elevate her to the position of the liberated woman within the Mystical system of Thelema. 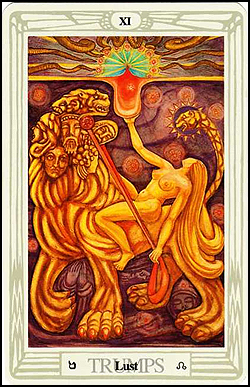 This culminated in a series of magical rituals known as the Babalon Working. These took place between January 4 and March 4, 1946 by Jack Parsons (the co-founder of the Jet Propulsion Laboratory JPL) and his partner and scribe Frater H.
The point of these rituals was to invoke and manifest Babalon, then to conceive a child who would bring forward the aeon of Horus and the death of all religion. The success of the rituals has been debated ever since, in esoteric and occult legend. Jack Parsons died in 1952 aged 38 in an explosion at his home, and rumors have persisted of a magical working gone wrong. A crater on the far side of the moon is named after him. After the Babalon working, the scribe, Frater H, eloped with Parson’s wife and his money (a skill he became very good at). The identity of Frater H? None other than L Ron Hubbard the founder of Scientology!